Hi! We are David and Diane and we moved to beautiful Lake George in May 2005. After enjoying Lake George from shore for a year we yearned to see it from a different perspective. We purchased the Super Skirt, a 24 foot deluxe pontoon boat, and for the next 3 years we explored every island and picturesque view the “Queen of America’s Lakes” had to offer. We also learned that many Lake George visitors missed most of Lake George's best natural attractions - “the nooks and the crannies”. Why the Super Skirt? Diane's Dad always wanted to name his boat "Super Skirt", a pet name he had for her mom, who was a terrific lady. He never had the opportunity. In honor of them we have carried out his wish. 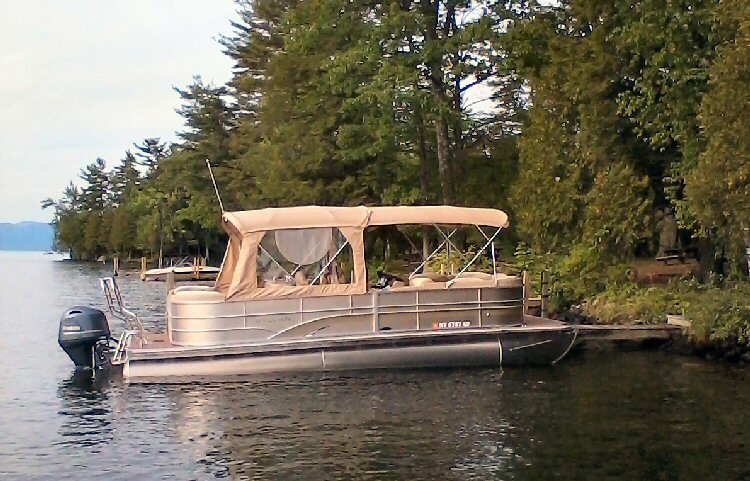 The Super Skirt II is a 25’ Sylvan pontoon boat powered by a 115 HP outboard. She is outfitted with Plush Seats in 2 separate seating areas so you can enjoy both sun and shade. She easily accommodates up to 12 people and has Sirius Radio for you listening pleasure. She has been inspected and is certified by the State of New York for tours on Lake George and has all required safety equipment on board. In the off-season Dave runs Whalen Gas & Fireplace installing and repairing wood stoves, gas stoves, appliances and furnaces. Diane owns and operates Adirondack Pet Sitting year round.